when you’re out for brunch with a designer (the amazingly talented andiestablishment) and a chef (imacuisine) you know you’re in for a fun morning of non-stop talking, extra dishes to taste test and friends who don’t mind you interrupting their meal for the all-important photos! a couple of sunday’s ago, us three ladies (with our obliging husband’s in tow) took over – or so it seemed – the large front table at windsor establishment, mr mister. 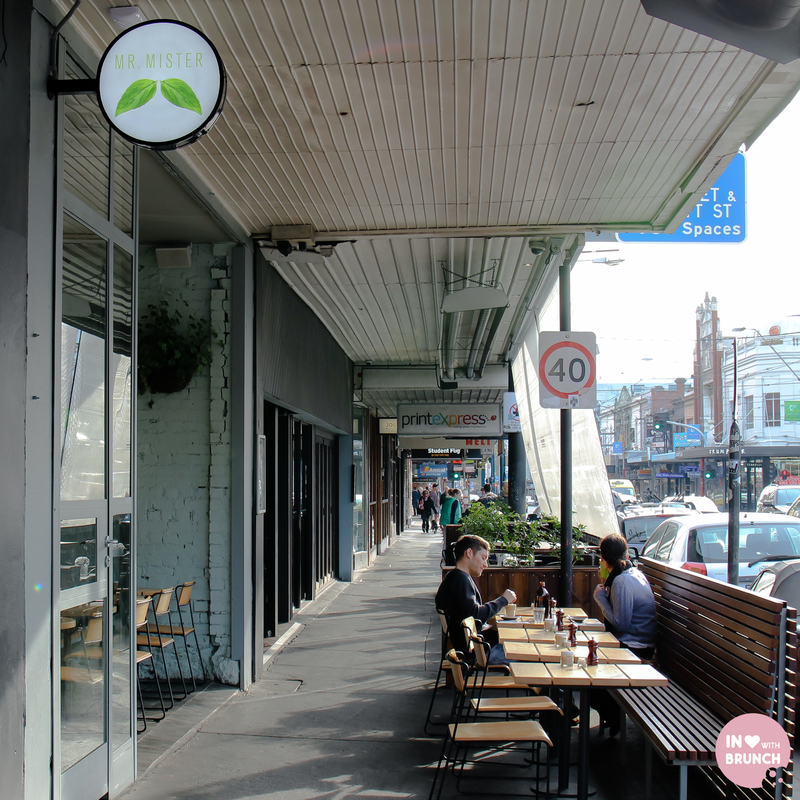 the café opened late last year and is a welcome addition to chapel st, which despite its melbourne-egde has always seemed to me to be a bit lacking in hip brunch spots. however with journeyman and also hannah now quite close nearby, i feel that the tide might have turned on this iconic street. 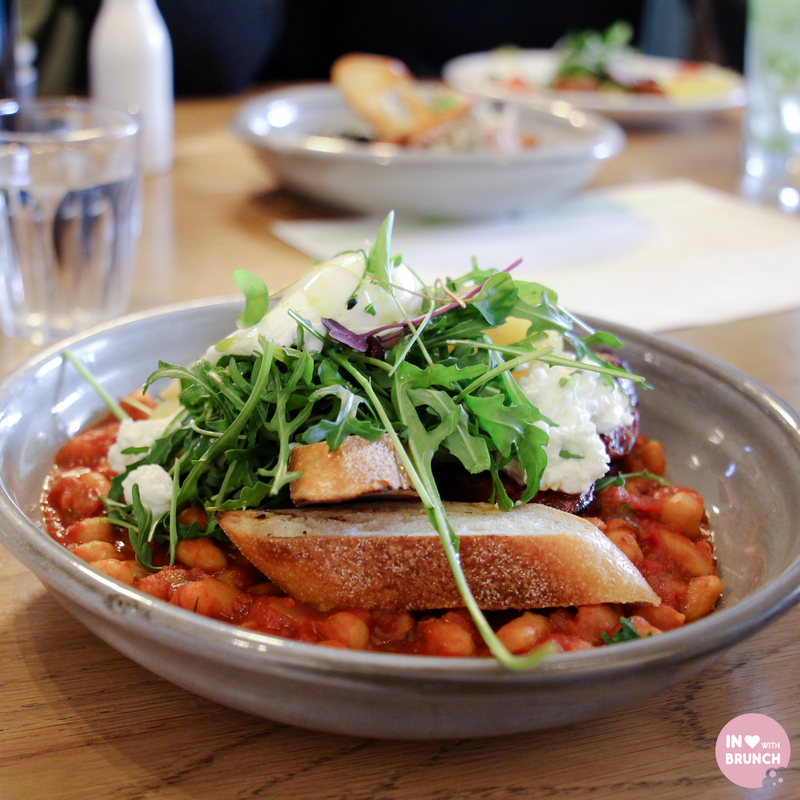 the café serves breakfast and lunch (not open for dinner… yet!) with a contemporary menu designed by head chef john-paul dargan. it’s an intriguing selection with some left-of-centre dishes (as you’ll see below), but still serves up your more traditional breakfast dishes – so guaranteed to keep a diverse, fussy or large (like ours) group satisfied. coffee is served by one of my melbourne faves, niccolo. all served consistently hot, strong and delicious. 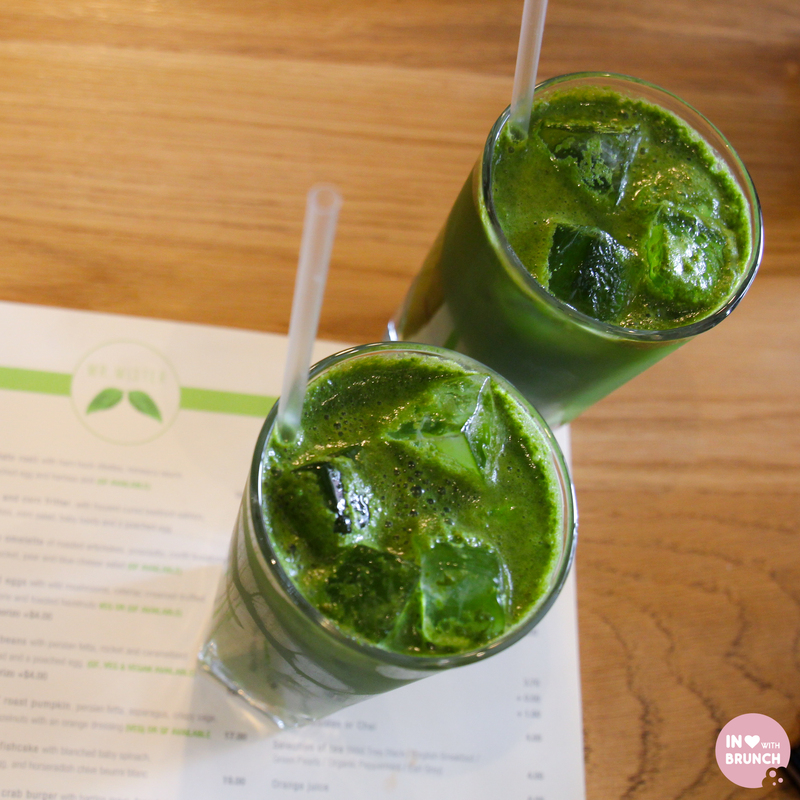 a couple of us around the table also opted for a healthy green juice: apple, cucumber, ginger, kale + grapefruit juice (after all, this was the morning after the day that was #dayofthedonut). now, onto the food! unlike your more conventional baked eggs with a tomato base, these eggs were baked in a completely vegetable and gooey creamy cheese base. the celeriac + truffled leeks gave this baked eggs an earthy root vegetable flavour and the eggs were perfectly runny. there were plenty of oohs and ahhs coming from the corner that ordered this dish, and at one point i even heard a “best baked eggs i’ve ever eaten”… i’d take that as a pretty good sign! a refreshingly healthy dish this left a clean taste on my palate. it was very well balanced – both in size and in flavour. 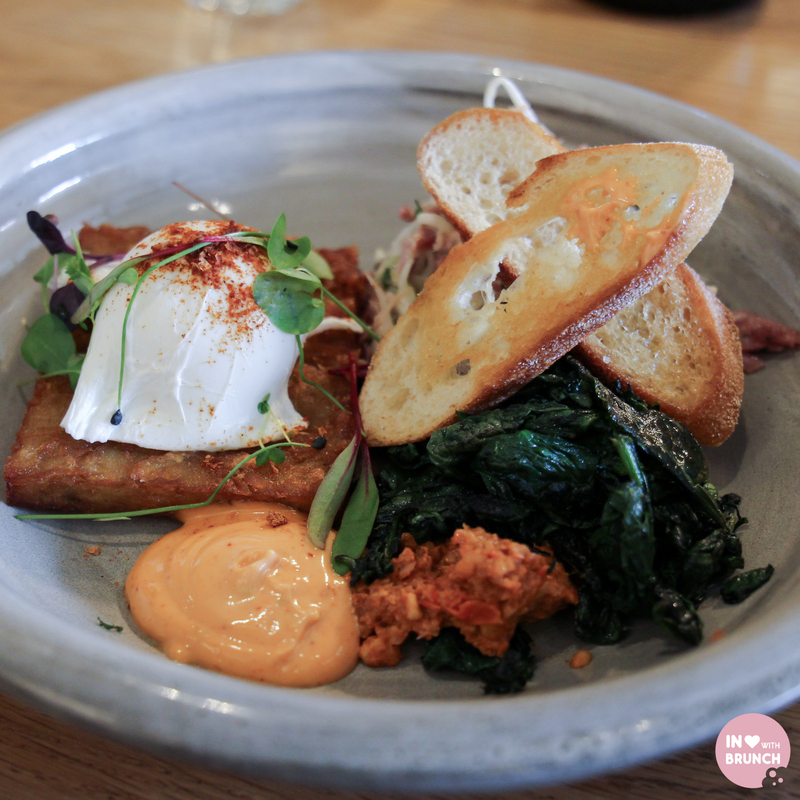 the poached egg was perfectly cooked, and when cracked over the crispy tender potato hash and combined with the spicy-smoky aoili, was absolutely mouth-watering. add in a mouthful of blanched spinach with the tender ham hock + the crunch of the toasted bread and this was like a tasty little savoury breakfast board. delish. beurre blanc translates from french as “white butter” – a hot emulsified butter sauce made from a reduction of vinegar and/or white wine and grey shallots blended with cold butter. the sauce originates from central france and is similar in flavour to hollandaise. legend has it that the sauce was invented “by accident” when chef clemence lefeuvre intended to make béarnaise sauce but forgot the tarragon and egg yolks. this sauce was rich, buttery and comforting (exactly as french food should be!) and the addition of horseradish and chives lifted it to the next level. 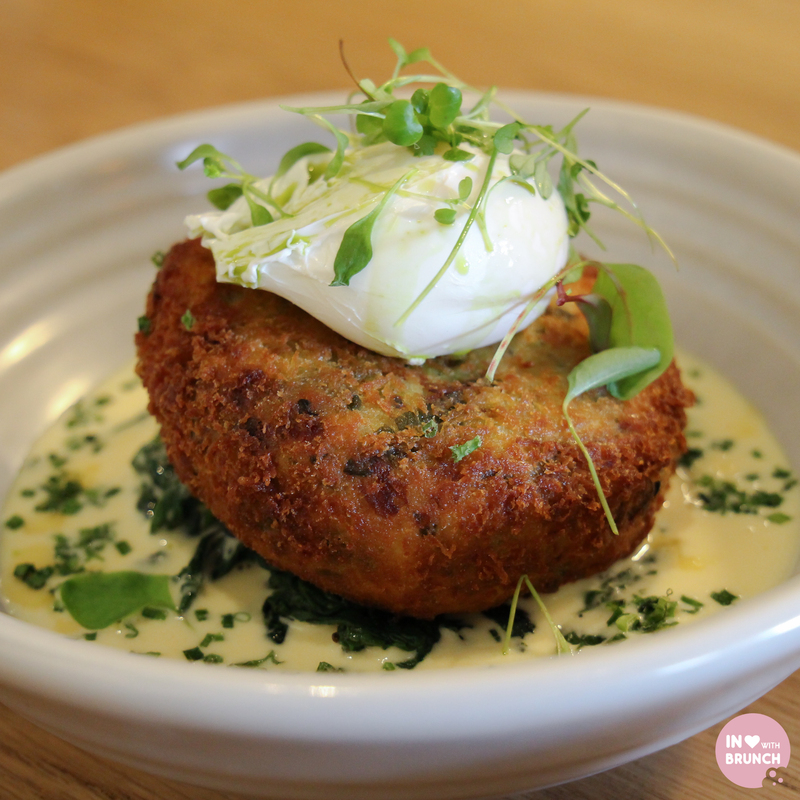 and when paired with easily the best fishcake i’ve ever tasted – crispy outside, generous portion size and perfectly cooked cod… yum! needless to say, the rest of us around the table had food envy and were secretly wishing we’d order one of these all to ourselves! continuing the theme of the morning, this serving size was gen-er-rous which means you certainly need to really like baked beans. i don’t (personal preference) so didn’t try this one, but the plating was beautiful and still photo-worthy. those around the table that did commented that the tomato-based sauce was rich and creamy and teamed well with the crisp freshness of the rocket and pear salad. besides feta is always a good idea… right?! 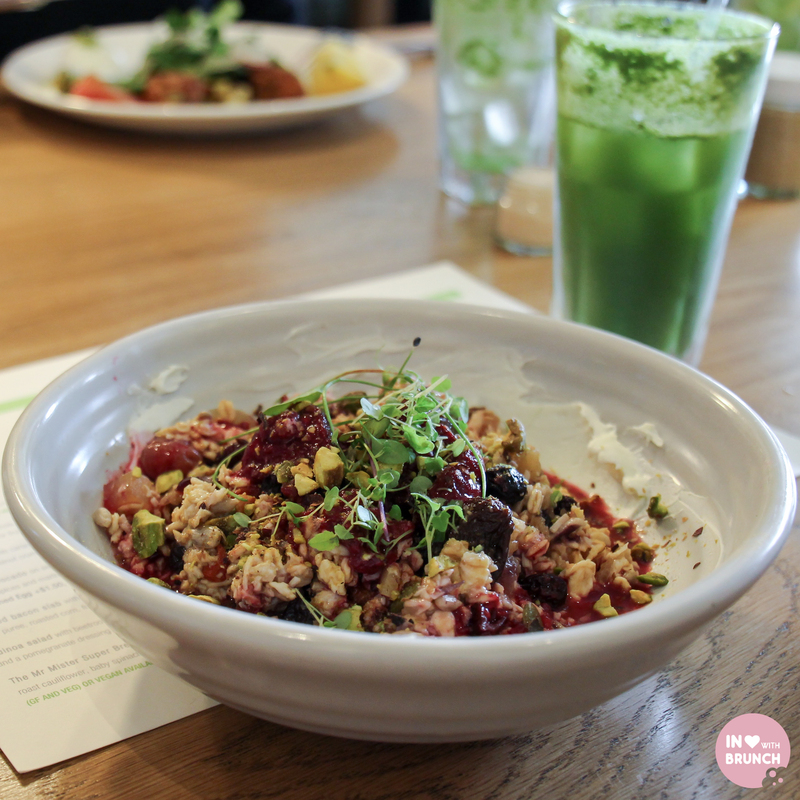 a fitting way to end our meal, we all dug in for a share of the one sweet dish we’d ordered – bircher muesli. the fruity flavours of sour cherry and various berries were lovely, and i am a huge fan of pistachios (and appreciative of any menu that can keep a bircher at $13 and still include pistachios which are upwards of $27/kg). however, overall this dish was very sweet and i’m not sure i could’ve got through a whole serve on my own – perhaps a little less sauce and a tad more yoghurt would’ve balanced it a bit more. these light, simple and clean ingredients were combined with finesse. 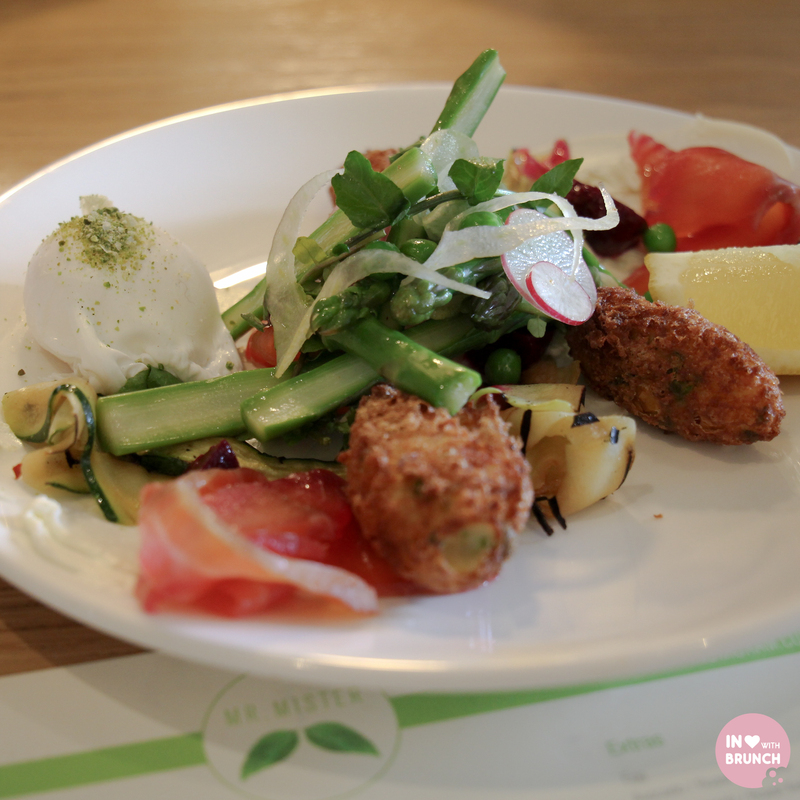 silky salmon, ribbons of zucchini, crunchy fritters + another perfectly poached eggs brought together by the zest of the lemon. another healthy and flavour-packed dish. service from start to finish was exceptional. 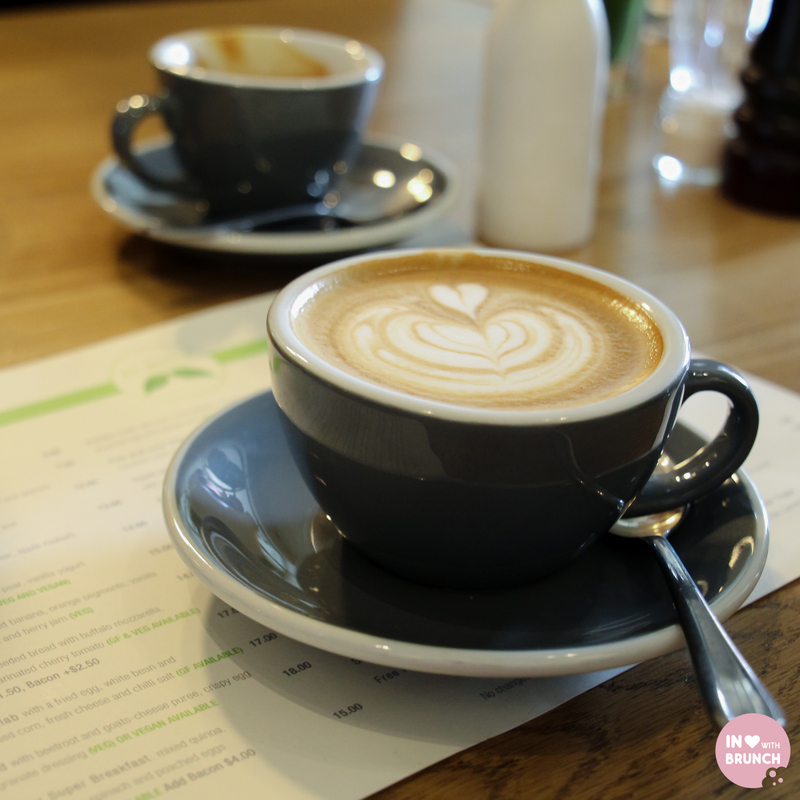 i had turned up a bit earlier in the morning to see if it would be possible to give them some advanced warning of our large table arriving and it was no trouble at all –a brunch spot that would let us make a reservation! yay! keeping up with our fast-talking excited group couldn’t have been easy either, we were firing off coffee, drink and food orders in quick succession. not a single issue with any of them, and the food arrived shortly thereafter. in summary a wonderful brunch – great coffee, food + company! verdict: hats off to you mister! 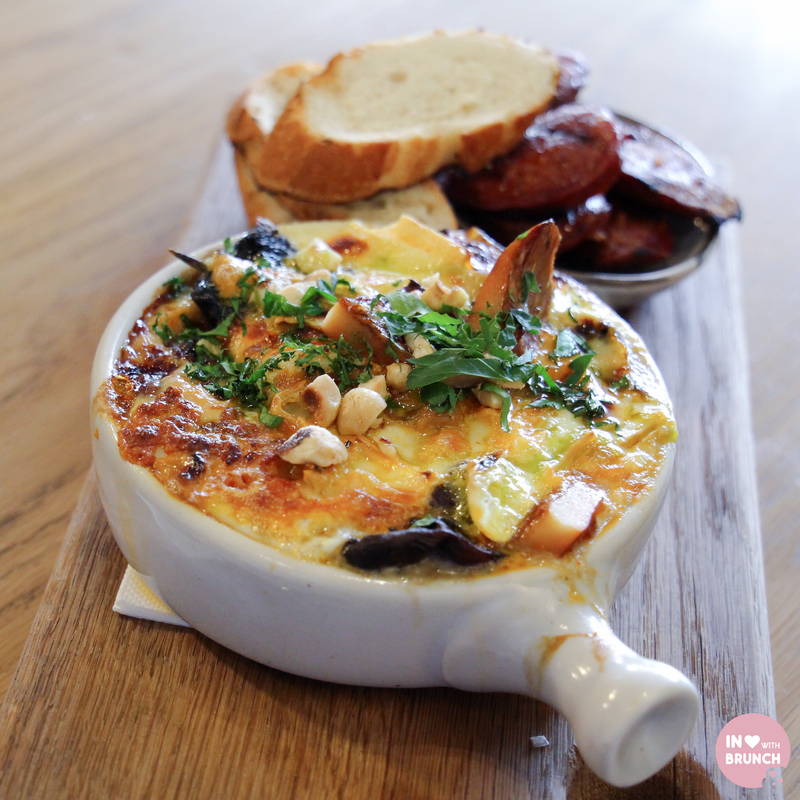 I have never seen baked eggs look so lush! Thanks for stopping by Rosslyn.